The Federal Government has appealed to Nigerians, especially those living in flood-prone areas to stop blocking drainages to enhance the flow of water. Vice President Yemi Osinbajo made the plea in a statement on Thursday by his spokesman, Laolu Akande. “One of the things I’d want to say is that we have to change our habits in terms of blocking drainages. By and large here, if you look at the channels, they are huge,” he said when he visited Abeokuta on Wednesday. Professor Osinbajo, who was on a condolence visit to the Ogun State capital, noted that while it was difficult to avoid flash flooding anywhere, the situation would have worsened if the incident occurred late at night because it would naturally cause a disaster. He advised those living in the axis and similar areas in other states to move quickly to higher grounds when the rains are heavy, to prevent the loss of life. 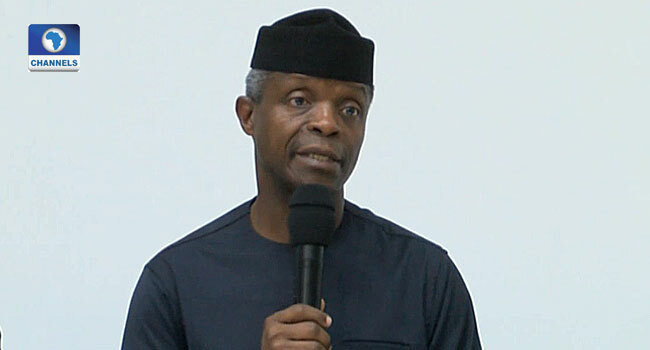 The Vice President sympathised with the flood victims and those who lost their loved ones to the incident, saying the government would improve on the drainage infrastructure in the affected areas. He said, “On the whole, the loss of lives is very unfortunate, and we commiserate as the Federal Government. But I also want to say that God had been truly gracious to us. It could have been much worse, but for the large infrastructure here, canalisation and drainage, which helped to move the water quickly, the water has practically receded despite the surge. Osinbajo added, “Of course, we are providing immediate relief materials to support the state government; the Director General of NEMA is here, providing that immediate succour and assistance. He, however, called for more citizen awareness so as to avoid future occurrences and commended the state government for its prompt response to the incident. The Vice President, who was received by Governor Ibikule Amosun, was taken round the affected areas, including Kuto and Isale-Igbein where at least 11 lives were lost, and several houses destroyed.